Employment in the Province was placed at 91 percent and is mostly agricultureled(NSO, 2002). 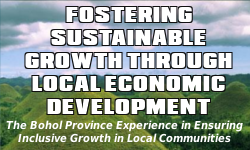 Agriculture is the main source of economic activity in Bohol with a greater number of its people engage in farming and fishing. It is Bohol’s major industry occupying most of its vast tracts of land. The fish sanctuaries strategically located around Bohol contributed to high fishery yield. Further development of these industries, however, requires, among others, improvements in irrigation facilities and agricultural technology. Bohol, however, has done relatively well with regard to human development when compared with other provinces and countries, as measured by the Human Development Index (HDI), a composite measure of education, income and life expectancy. Per the Philippine Human Development Report 2002, Bohol falls within the medium human development category and is comparable to that of Vietnam but slightly better than Indonesia. This positive trend shows that despite the limited cash income, Boholano families were still able to manage their resources well to minimize the impact of low income on their quality of life. The life expectancy at birth for Boholanos continues to improve through the years from 64 years in the 90’s and is projected to improve to 73 years by 2015(Fieger & Cabigon, Life table Estimates).